I am a student in the Modern American Poetry class at Episcopal High School in Alexandria, Virginia. 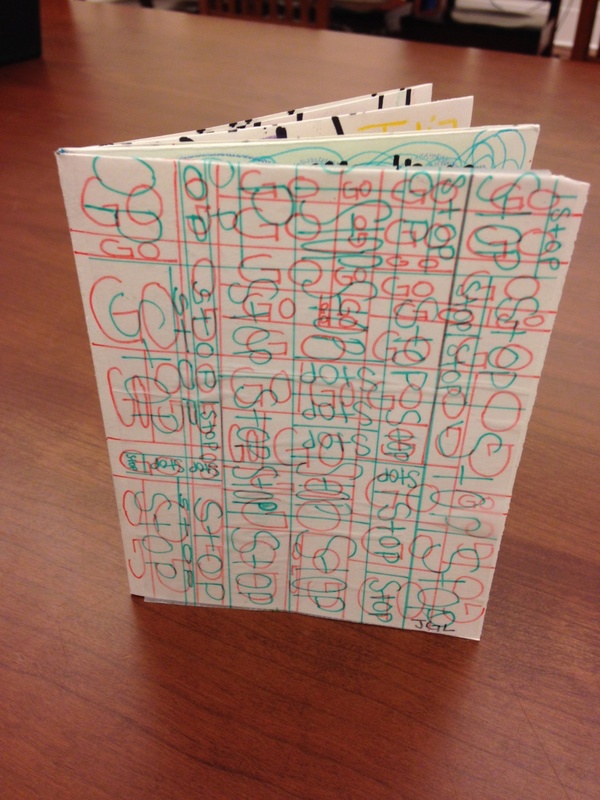 My class worked on these books with visiting artist Wendy Wolf. Modern American Poetry is co-taught by Molly W. Pugh and Elizabeth Vorlicek and combines the study of poetry, from the Modernist era, with the studio practice of making artist’s books. The use of repetition in the book, such as the words stop and go suggest a push and pull that is relevant to the modern world's constant busy life. The book is small and this contributes to the intricate detail used in making the book. Inspiration for the book came from the use of lines, representing social norms controlling people’s actions in life. The use of color was bright to provide a contrast to the sharp lines; the color also alludes to people who think outside the lines and break out of boundaries.